i started it about a week ago, and finished the cross stitched embroidery, but so far i don’t have a plan for edging… any suggestions? i’m thinking skråbånd (sorry, norwegian word only), or folding it and pulling out a thread or two from the fabric to sew along. so far i’m leaning towards the last one. the pattern is from familien nr. 16, 1988. 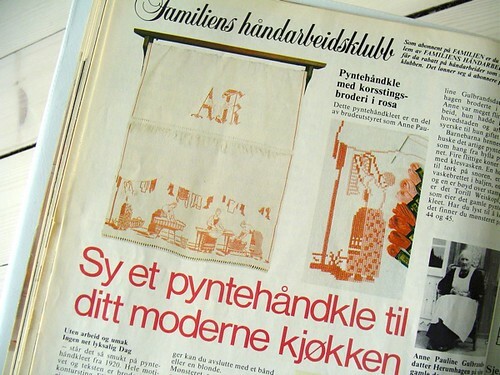 The original pattern was embroidered by anne pauline gulbrandsdatter herumhagen in the 1880ies, and it’s her on the picture down in the corner. isn’t that pretty neat? i didn’t like the bright and bold pinks suggested in the pattern, so i’m using DMC mounliné no. 760 and 347 instead. 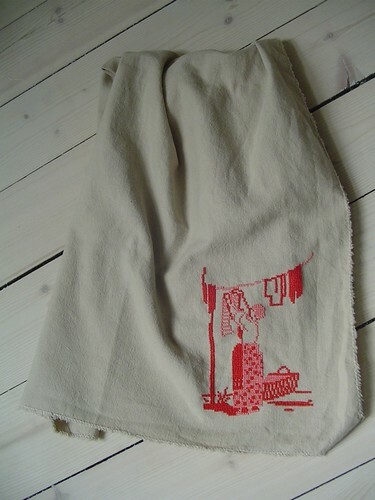 i have plans to embroider each one of the 4 working women on 4 different towels.